1/2 inch piece of ginger, peeled and grated. 1/4 tsp. red chilli powder (adjust to taste). Heat the mustard oil in a wok or karahi. Add the cumin/mustard seeds and asafoetida powder and wait until seeds splutter. Be careful not to let them burn. Add ginger, garlic, chilli and onions if used. Stir fry for a few seconds, until ginger garlic turn lightly brown/golden. Add the parwal and potatoes and sprinkle the turmeric, coriander, chilli powder and salt on top. Stir-fry thoroughly for a few seconds and then lower the heat to minimum. Cover and cook until the vegetables are cooked, stirring from time to time. If the vegetables are fresh, no extra water needs to be added. Otherwise, sprinkle some water to stop it from catching. Sprinkle the garam masala and mango powder. Raise heat and stir-fry, until all liquid is absorbed and the vegetables look shiny. Turn heat off. 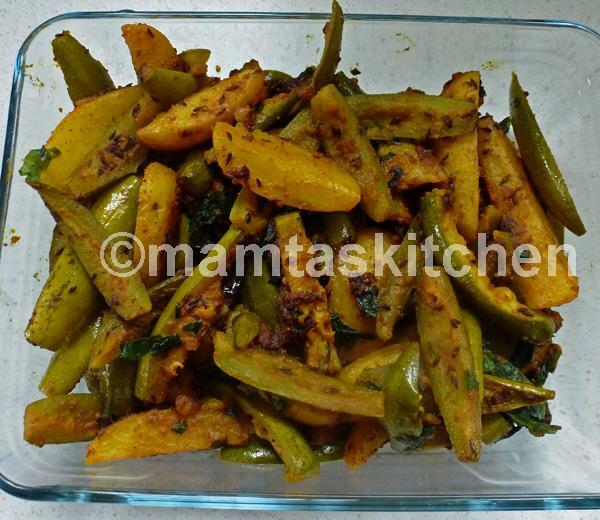 Serve with Plain Paratha . Chopped tomatoes can also be added at half cooked stage.